Meet our featured animal, the Atlantic puffin! Despite their black and white plumage, puffins are not related to penguins at all. They are members of the Alcidae (auk) family. 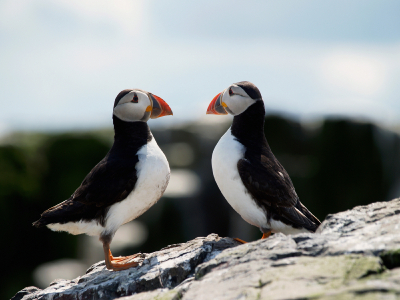 For most of the year, Atlantic puffins live on the open ocean. Diving as deep as 60 m (200 ft.), they swim by flapping their wings as if flying through the water and use their feet to steer. Atlantic puffins are excellent fliers. Flapping their wings at up to 400 beats per minute, puffins can reach speeds of 88 km/h (55mph). When a puffin is around 3-5 years old, it will choose a partner at sea to mate with for life.